Well, that was frustrating yesterday! Just as I was getting on a roll, the blogging interface ceased to function properly and I couldn’t add images or text below the bottom picture! 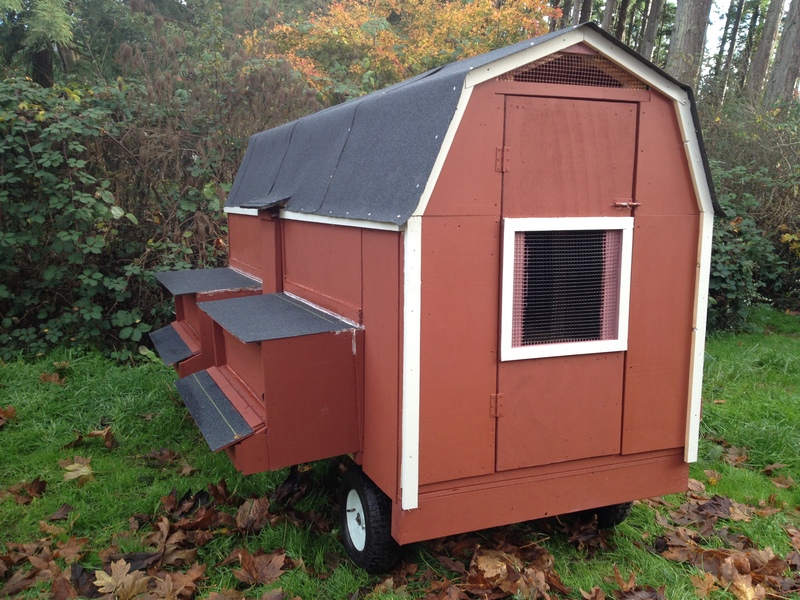 Not that a description of chicken house building is so compelling that stopping where I did counts as a cliff hanger, but if you are someone who likes to complete one thought before moving on to the next, sorry about that. 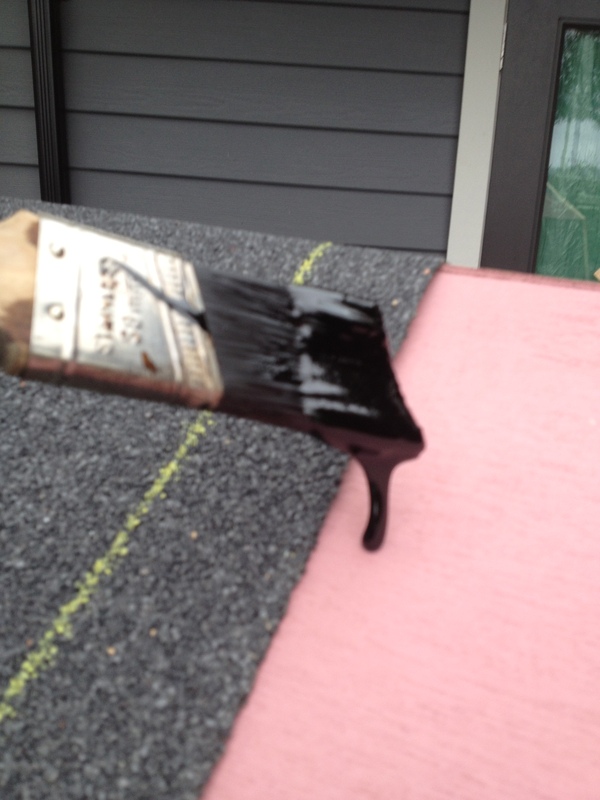 Sticky black goop to glue down the roof and seal everything… Roofing was also nailed down. 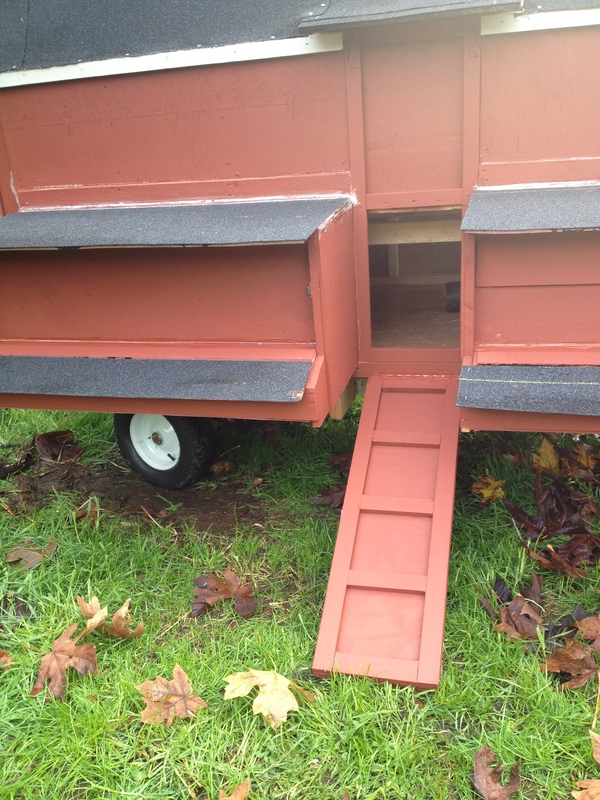 We were really, really careful to use lots of sticky black roofing goop (for some reason, as I did this, I kept thinking of Brer Rabbit and his tar and feathering incident) but even so, after everything was assembled and sealed (so we thought) we had a couple of leaks. In the next photo, you can see how we should have made the main/upper roof overhang a bit wider on the nesting box side of the building. Though we had also ‘roofed’ the nest boxes, the water dripped off the upper roof and enough collected in the seam between the exterior wall and the nest box top that a bit seeped inside. It wasn’t exactly a flood, but even a bit of water soaking into bedding would lead to mould and other nastiness down the road. At first we tried to caulk the crack with a silicone bead, but in the heavy rains, it just washed right out. We had to scrape out the ineffective goop and use a super-sealant that works to seal cracks even when wet. This did the trick and the interior is now staying bone dry. 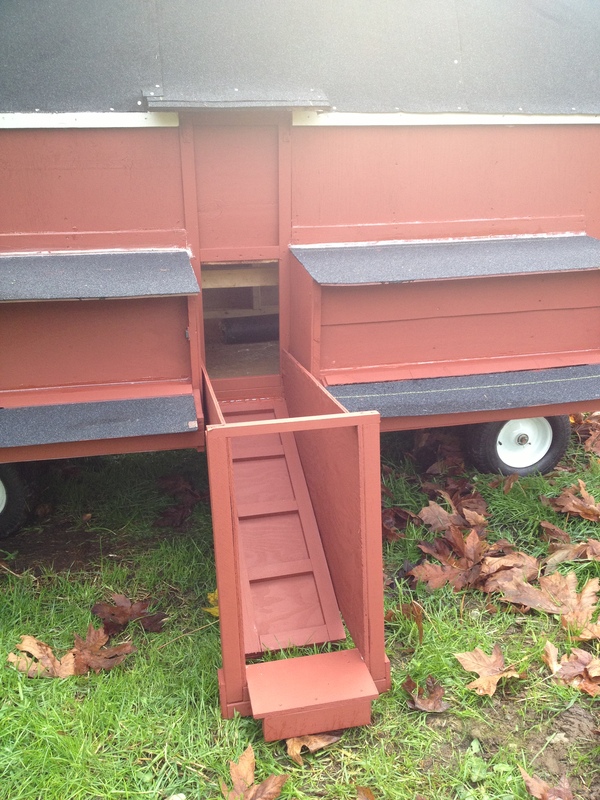 Here’s a view of the nesting box side with the ramp up. We thought we were being very clever to have the hens exit through a different door to the humans. This would mean they could carry on with their business while the human carried on with hers (human door is large and at the end of the building). 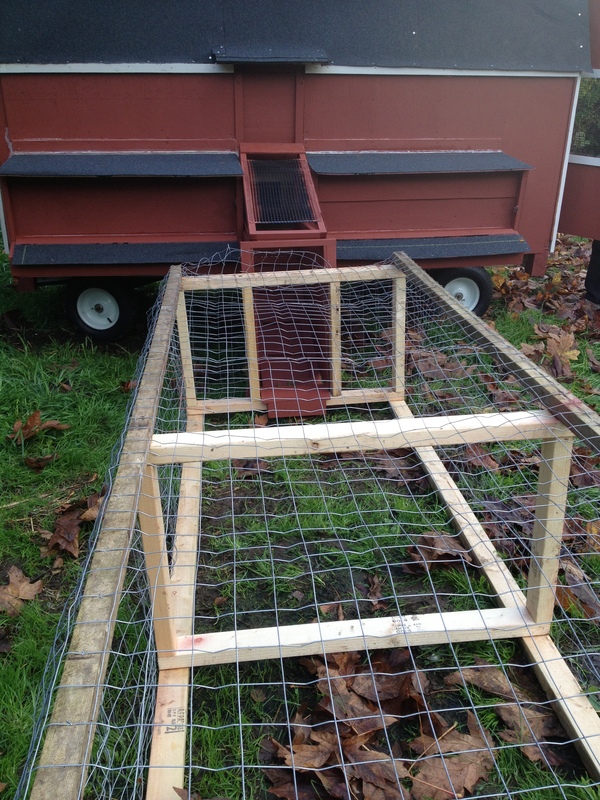 The only problem was, by situating the hen ramp between the two nesting boxes, we created a bit of a design nightmare when it came to figuring out how to make a sort of chute for them to use when the ramp was down so they could get in and out of their protected run. Keep in mind we needed everything to be lightweight and movable. After we had built a solid-sided chute, we realized we couldn’t fasten on a top of any kind because then one wouldn’t be able to lift the ramp up and down when the chute was in place. So the next step was to come up with a cap of some sort for this whole fancy system. For this part, we built a very light frame and covered it with heavy mesh. 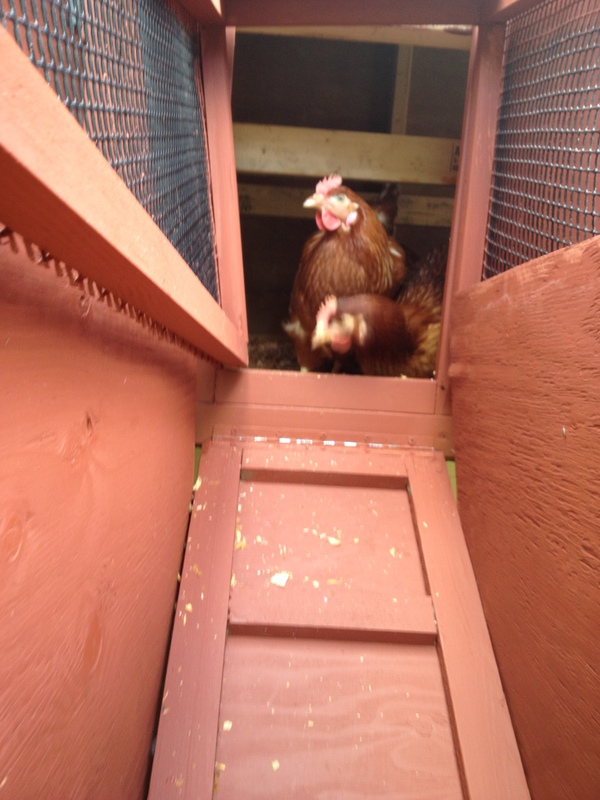 Perhaps predictably, the chickens were a bit confused when we first put them into the house. Eventually, though, they got it figured out and were running up and down the ramp with impunity. The ramp leads to a portable pen (only part of it seen in these photos – the long, narrow run was initially meant to lead to a larger, more square area, but we are going to repurpose the long, skinny run as a vegetable bed chicken cleanout run- as in, we’ll place it over a bed to be cleaned out in the garden, put a few chickens in there for a few hours and let them do some cultivating). The system of attaching the more square run will be similar to what you can see in the photos here. 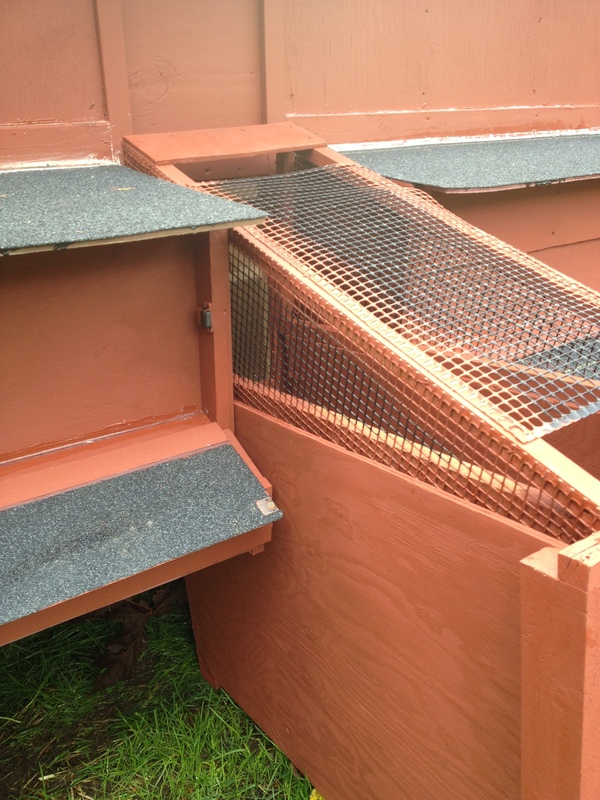 In my next post I’ll talk about some issues we’ve had with the interior design and modifications we need to make to the nesting boxes… I’m thinking that by the time we have built our twenty-seventh chicken house we might just have all the bugs worked out! Here are a couple of brave girls standing at the top of the ramp considering their options. Long, narrow run that was meant to lead into a larger turnout area… plans have changed once again. 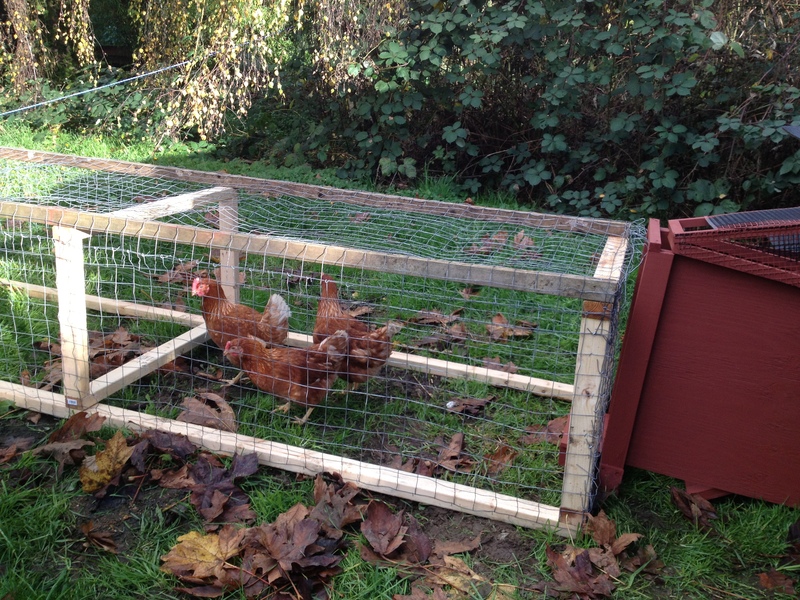 Chicken house and run set up for testing on the back lawn (so it was handy for modifications). 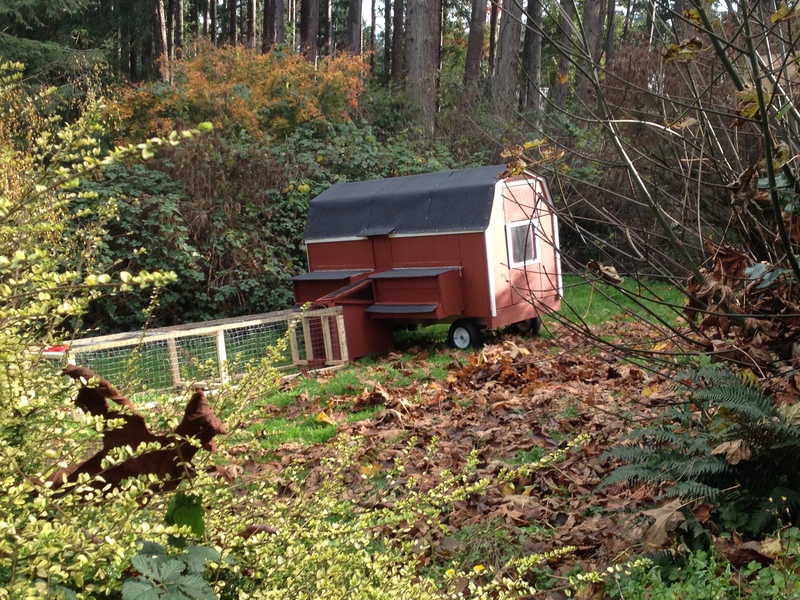 The whole set-up will be moved to a larger poultry-raising field down the road. 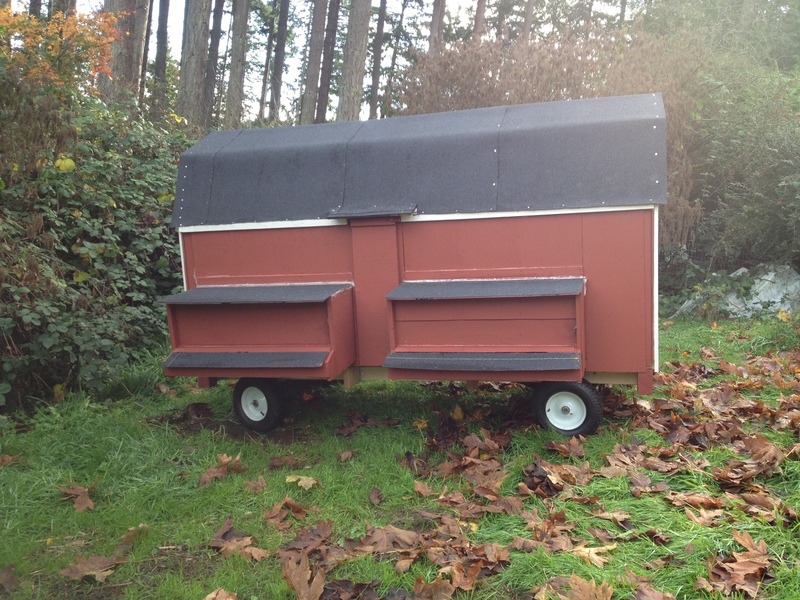 This entry was posted in Blog, Chickens, Uncategorized and tagged 30 Day Farm Blog challenge, agriculture, building project, chicken coop, chickens, chooks, coop design, Dark Creek Farm, farm, farm life, homestead. Bookmark the permalink.